Three "M" Boer Goats - We raise Fullblood & Percentage Boer Goats. We offer for sale show quality Bucks, Does, Wethers, and Breeding Stock We have proven quality genetics in our program and have produced Grand and Reserve Champion Wethers and Does every year we have been in operation. We keep approximately 35 animals and show extensively in the ABGA shows around Texas and assist local 4-H and FFA youth in the acquisition, raising and showing of wethers and does raised on our ranch. Laura & Louis Wolting, 277 County Road 342, Gonzales, TX 78629 www.threemboergoats.com. ROYALL ACRES FARM We offer show wethers, bucklings and doelings for sale. We also occasionally have LGD's for sale. 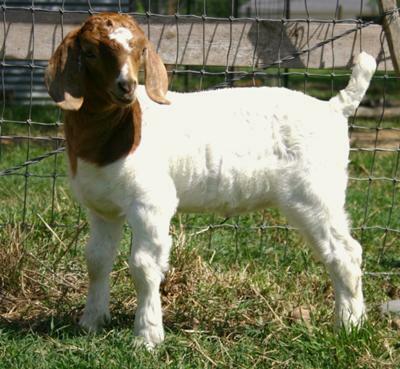 Please visit our website for more information and photos of the goats for sale. Nikole Ainsworth. arabianlvr2020@aol.com. www.royallacres-boergoats.com, Frankston, Texas.